Sidewinder SCT controller offers a 40% increase in power handling over the previous Sidewinder 1/10 but keeps the same great Sidewinder affordability. The Neu-Castle 4 pole 1410 1Y motor offers 50% more torque than Castle's great CM36 series motors of similar kv. This is a 2 cell race motor perfect for 2 and 4 wheel drive Short Course Trucks. Add some cool to your motor with the included CC Blower fan and shroud and you are ready to run with the big boys. 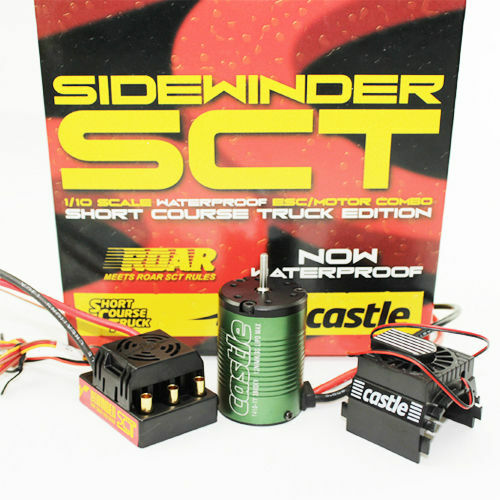 The Sidewinder SCT is ready to run out of the box, but it is completely Castle Link™ compatible too – drivers can use their Castle Link and Windows PC to tune and tweak all their favorite settings such as brake and throttle curves, throttle response, drag brake and many other parameters that add up to an incredible RC driving experience.